I, Giovanni (=John) ... you fellow and friend ... assist when the Master arrive and if you browse the Italian Edition ... you will discover Sanat Kumara talk very much that night for Italy (from 9:00 pm until 6:30 am of the day Friday February 10 ... until the morning of 11 in the year 2012. The Book of Revelation was written in the Lexicon of God and therefore ... the study of such book is extremely important. The Seven Candlesticks and the Seven Churches are not as you can image ... but advanced concepts ... The Seven Bodies of Man. Now ... was correctly described in the Book of Apocalypse explained ... the Seven Seals ... which are ... in one of the senses ... The Seven Chakras. You will need years to understand who was the ... Lord of the Garden of Eden and he was Lord Maitreya ... in Physical body ... like in Physical Body he ... sometime visit Modern Yemen or places with great suffering. and Who Know the Root of David as the Living Christ: Behold he cometh unto thee, O children of the Most High God. Behold he is in thy midst, and I AM in the midst of thee, and we are one in the Lion, the Calf, the Man, and the flying Eagle. The book is the book of the living Christ. The seven seals seal the seven spheres of the Cosmic Christ consciousness which are his to transfer through the path of initiation on the Ruby Ray to the sons and daughters of God. Ye cannot receive these initiations except ye become as a little child, and the little child then choose to become the Manchild, accepting the proffered gift of Sonship according to the covenants of the God of Israel. Thus I, the Ancient of Days, have dwelt upon the mysteries of Sonship before proceeding with the understanding of the opening of the book and the loosing of the seven seals. The seven seals are upon the seven planes of heaven and the seven spheres of the Universal Causal Body of God and the individual causal bodies of those who elect to be God because they are of God. The seven seals seal the path of initiation and the light of the Cosmic Christ from all except those who are the true heirs of the white light of the ascension because they have submitted to the fiery furnace of the Rose Cross and the initiations foursquare and the four initiators on the Path of the Ruby Ray. These are they who are made unto our God kings and priests: and they shall reign on earth as in heaven. No man is found worthy to open and to read the book, neither to look thereon, save the Manchild fully clothed with the light of the Ancient of Days and the descent of that light through the progressive order of hierarchical revelation. The Root of David is the lineal descent of Christed being marked by the seven planes of heaven, the seven spheres of the causal body, and the seven chakras in the body of God. The seven-sealed book is the record of the Great Pyramid of Life of which each individual Christed Son is at once the whole and the part—the All in the all, the geometry of the Pyramid and a single, lively stone within it. The lineal descent from the great white throne to the soul/saint moving in time and space is a seven-tiered spiral, reaching from earth to heaven and heaven to earth. The fourth tier is the mystical light in the center of the Pyramid, the flame in the heart of the Great Pyramid of Life that is the inner spiral of man, woman incarnate. The fourth tier is the point of integration wherein the multiplication of the lesser consciousness realizes individuality in Christ. Without the initiations of the Ruby Ray within the Kings Chamber, the Holy of Holies of the Great Pyramid of Life, there is no transition from the base of the Pyramid to the all-seeing eye of God. The fourth tier is the emerald of the fourth foundation of the Holy City and the fourth, the emerald stone in Aaron's breastplate. Now you know why I AM the emerald. Ponder well and put on my words thus far revealed to you in these discourses on the opening of the seventh seal. For I have placed therein the keys to the mystical reunion of thy soul with the living Spirit. All of this must go before the opening of the six seals and of the seventh seal of thine own Pyramid of Life. I stand in the midst of the earth in the heart of the Prophets and the saints. I AM the mighty deliverer of the seven spheres of immortal life whereby those yet bound by the law mutable shall be unbound by the law immutable. And the mortals whose origin is of God shall put on immortality, and that flesh and blood which is corruptible shall be translated to share the inheritance of the Incorruptible One. Let all reckon with the white flame of the Mother and the fiery furnace white-hot. Let all heed the Word of my son Serapis (he was Leonidas, King of Sparta), who delivers the mandate of the ascension coil and the ascension sword. His Word is the golden Word for the golden age. He is the strong angel who proclaims with a loud voice, "Who is worthy to open the book, and to loose the seals thereof?" And my answer to him is my answer to the seven chohans, "Lo, thou art worthy because I AM worthy, because thou art myself in the seven planes of being." Thus the order of the hierarchy of the Ancient of Days is revealed and the seven Sons of God, the Lords of the Rays, become the initiators in my name, in the name of Jesus Christ, of the Son of man within you, Keepers of the Flame of Life. And all ascended masters of the Great White Brotherhood who have followed in the way, the truth, and the life of the attainment of Christ Jesus occupy the office of the Man—the Son of man who is become the Son of God. For he has chosen to make them no longer servants but friends, and if friends then co-equals, joint-heirs, co-creators with him. Indeed they have become the Son of God. Their light is the brilliance of the sun at noonday. Any lesser appellation is the blasphemy of the denial of the all-power in heaven and earth of Jesus Christ to transfer full and co-equal Sonship to the sons and daughters of God. He, the firstfruit and the quickening Spirit, is become the All-in-all in every pyramidal line and in the lineage of the Great Pyramid of lives. We cast out the demons and the wolves in sheep's clothing who have entered the Temple Beautiful of the soul and there denied the living witness of the abundant life of Jesus Christ in the person of all sons and daughters of God who have submitted, utterly and totally, their being unto his being. Thus the seven chohans with the Maria Chohan, the representative of the Holy Spirit, serve with the World Teachers Jesus Christ and Saint Francis, known today as the Ascended Master Kuthumi. (Koot Hoomi). Thus the Saviour has chosen to share his body and his blood with Francis on earth in the visitation of the seraph in the stigmata, supreme rite of Christ crucified in the body and soul and heart and mind, yea, in the flesh and blood of Francis. He who accorded him in my name the honor of the reenactment of the crucifixion, which was in him bodily, has so accorded him in heaven the same oneness bodily. This oneness is earned by love, self-sacrificing love, selfless love, a love that walks daily in the order of Saint Francis the path of surrender and service through the vows of obedience of the heart, chastity of the mind, and poverty of the soul. Thus the east side of the City Foursquare and the three gates thereon are held by the ascended masters for and on behalf of their unascended chelas, the embodied disciples of Christhood, the pilgrims of peace and truth and freedom and enlightenment whose emblem is the Rose Cross. Behold, the Lion of the tribe of Juda, the Great Initiator, the Guru, the Father, the first and the last incarnation of the Teacher and the Teaching. With him are the bodhisattvas of East and West, the holders of the light of the heart. They are the Keepers of the Flame of the indwelling Christ in the heart who chant the chant of the "Abba, Father" in the many languages of the Word and in the tongues of angels. As the ascended masters hold the image of the Christ as a face of a Man within the souls of the body of God, so the Buddhas in the becoming and the initiates of the White Goddess hold the image of the Lion as the definer and the refiner of the sacred fires of the heart. The Lion of the tribe of Juda is the Christ, the Great Initiator in your midst, without whom there is no path. 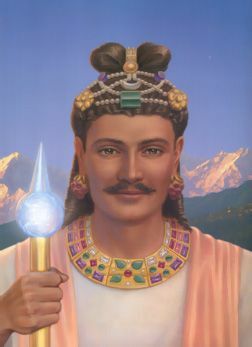 As the ascended masters, serving with the Saviour Jesus Christ, open the seven seals in the level of the soul—the solar awareness—of individual identity, so the ones anointed on the path of the Cosmic Christ and the planetary Buddhas open the door of the heart to those who pass the initiations of the seven chohans, the Maha Chohan, and the World Teachers within the seat of the soul. The Great Rebellion and the Fall. Prepare to meet the All-in-all. All of those described by the angel (Uriel) messenger of Jesus Christ who spoke to John and gave to him the seven-sealed Book of Revelation, all of those robed in white gathering round about the throne of the Lamb and under the altar of the Threefold Flame are the initiates of the Ruby Ray whose names are written in the Book of Life, who day by day are getting the victory over the beast by the blood of the Lamb and by the Word of their testimony. They know the Root of David. They know his soul who has become the quickening Spirit, the Saviour of the world unto Jew and Gentile. They know the Lion of the tribe of Juda as the Guru in the garden who is come again to initiate them in the mysteries of the indwelling Christ. This Father Maitreya, this Son Jesus are one. Behold, I and my Father are one. No argumentation or carnal logic can deny the oneness of the living LORD in manifestation. For he has ordained it and it is so by the Logic of his Word. And that which is, is. And that which is real, is real. And no false doctrine or dogma can confute the Cosmic Christ in manifestation in the heart of the initiate. Lo, I AM Sanat Kumara. I AM the intensification of the Ruby Ray within you, my beloved. And when the son Serapis proclaimed with a loud voice, "Who is worthy to open the book and to loose the seals thereof?" Lo, I answered, "I AM worthy. And because I AM worthy thou art worthy, O my son." Therefore, Serapis is opening the book on the law of the ascension in the lodestone of the Mother. Hear him well. For there are openings and there are openings. There are seals and there are seals. There are veils and there are veils. And thou, O soul, O initiate, must remove the veils of illusion, the seals of thy karma, which have effectively sealed thee from the Great Throne Room. There are doors of pride barricaded by rebellion that effectively imprison selfhood. Therefore the ascended masters come with the vision of the Son of man to teach thee the way of the balancing of karma and the transmutation of energies mis-qualified in the lower chakras. These initiations are preparatory to the initiations of the heart. They must be submitted to. They cannot be bypassed. Guard thy patience, and in that patience possess thy soul. For many have left the Mother, the messenger, and the ascended masters for exalted heights of which they fancied themselves a part, believing their way to be superior to the fundamental steps of Truth, the studying of the Law, the ritual of the sacred labor, and the childlike sweetness which day by day becomes the ripened fruit of true manhood and true womanhood. They have counted themselves superior. They have desired to enter the retreat of the heart without receiving the initiation of the washing of the feet by the Saviour Jesus Christ. "If I wash thee not, thou hast no part with me. "1 Thus rings his Word to the present hour. It is spoken to all disciples of Christ. Tarry then in the city of Jerusalem, the citadel foursquare of the Mothers mastery of the Matter body. Tarry with the Woman and learn her wisdom and become it. When thy feet are washed, and only then, mayest thou enter into the Ruby Ray initiations of the heart. I AM proceeding day by day with the initiation fourfold of the sons and daughters of light in the soul, in the heart, in the mind, and in the universal body of God worlds without end.